Duo Country US comprenant Joe Callahan né Walter Tommie Callahan, le 27 Janvier 1910 à Madison County (Caroline du Nord) et Bill Callahan né Homer C. Callahan, le 27 Mars 1912 à Madison County (Caroline du Nord). Joe est décédé le 10 Septembre 1971 et Bill est décédé le 12 Septembre 2002. 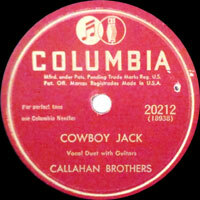 The Callahan Brothers were most popular during the 1930s and were known for their yodeling. They were born Walter and Homer Callahan (they later changed their names to Joe and Bill because they were shorter) in mountainous Madison County in western North Carolina. Their childhood was filled with the traditional music of the mountains and the recorded music of such singers as Ernest Stoneman, Riley Puckett and Jimmie Rodgers. After the Callahans began performing, they integrated yodeling into their act and it was this talent that called attention to them during a festival in 1933. Joe and Bill made their recording debut the following year in New York for ARC; they became the label's most popular duo during this era. That year, they also began appearing on WWNC Asheville, North Carolina. During their recording career, the Callahans moved to several different radio stations, including WHAS Louisville, Kentucky and WWVA Wheeling, West Virginia. Some of the Callahans' most popular tunes include "Little Poplar Log House" and country standard "She's My Curly Headed Baby." In addition to performing their own songs, the two also covered the songs of other performers. In 1940 the Callahans moved to Oklahoma to briefly work at a radio station in Tulsa. The following year they moved to KRLD Texas and spent the rest of the decade there and at KWFT Wichita Falls, Texas. The duo signed to Decca but didn't release many singles, instead recording transcriptions for the Dallas-based Sellers Company which were usually played on the radio. 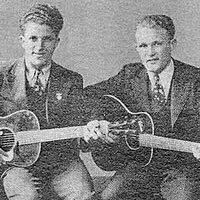 In 1945, the brothers went to Hollywood to make a movie, Springtime in Texas with Jimmy Wakely. Afterward they did a nationwide promotional tour with the cowboy crooner. 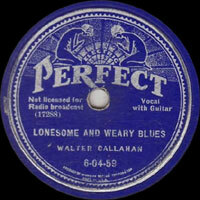 Later Bill went on an Eastern tour with Ray Whitely and in 1947 recorded a solo for Cowboy Records in Philadelphia. Four years later, the Callahans became Lefty Frizzell's opening act and recorded eight singles for Columbia. Later, Joe went back to Asheville and became a grocer while Bill stayed in Dallas to become a photographer; he occasionally returned to music as a bass player or a comic. The brothers briefly reunited in Dallas during the mid-'60s to do a few shows, but by this time Joe's health was failing and he soon returned to North Carolina. He died in 1971. Bill retired and remained in Dallas. 02/1935 78 t. MELOTONE M13275 (US) My Good Gal Has Thrown Me Down / Mama, Why You Treat Me That Way? 02/1935 78 t. BANNER 33308 (US) My Good Gal Has Thrown Me Down / Mama, Why You Treat Me That Way? 02/1935 78 t. ROMEO 5414 (US) My Good Gal Has Thrown Me Down / Mama, Why You Treat Me That Way? 02/1935 78 t. ORIOLE 8414 (US) My Good Gal Has Thrown Me Down / Mama, Why You Treat Me That Way? 02/1935 78 t. PERFECT 13098 (US) My Good Gal Has Thrown Me Down / Mama, Why You Treat Me That Way? 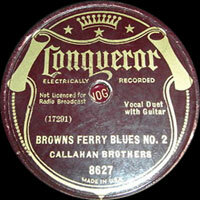 07/1935 78 t. CONQUEROR 8429 (US) My Good Gal Has Thrown Me Down / Mama, Why You Treat Me That Way?